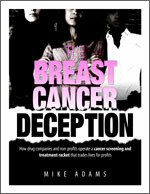 Welcome to Breast Cancer Deception, an eye-opening special report by Mike Adams, the Health Ranger. This is a shocking, tell-all report that exposes the scam of today's breast cancer industry, revealing how conventional breast cancer detection and treatment programs are actually designed to ensnare women into a very harmful (but highly lucrative) system of toxic treatments that will only cause permanent damage to her health. You've never read anything like this about breast cancer. It's the report the industry would prefer to censor, because it contains startling truths about how the cancer industry actually feeds upon the continuation of this disease while censoring natural cancer prevention strategies that could halt 90 percent of all future cancers starting right now. • Which breast cancer non-profit you can really trust! • How top cancer non-profits have abandoned cancer prevention in favor of screening and "treatment"